During the first half of the Twentieth Century two learned women based at the Griffith Institute in Oxford devised an economical yet effective filing system, so that information concerning antiquities from Ancient Egypt could be recorded on cards and categorized systematically in preparation for a bibliographical series. Patient research enabled Bertha Porter and Rosalind Moss to transform their earliest files into a comprehensive reference book and, with its launch worldwide, the series they envisaged was truly within their grasp. The title of this series was the Topographical Bibliography of Ancient Egyptian Hieroglyphic Texts, Reliefs and Paintings, often shortened by Egyptologists to Top. Bib., Porter and Moss or simply PM, in recognition of its co-founders. After the death of Bertha Porter, the production of PM volumes was continued by Dr Moss and her staff until the management of the project was assumed by Dr Jaromir Malek in the 1970s. Thereafter, the series was enhanced by the addition of wide-ranging appendices, and from the 1990s, with the rapid advances in digital and computer technology, Jaromir Malek's responsibilities expanded even further as he endeavoured to steer the series as smoothly as possible into the digital era. Since the 1980s an enormous increase in the quantity of books and periodicals dealing with the archaeology and culture of Ancient Egypt has taken place, hence the noticeable increase in the workload of the current PM staff and in the volume of data required for future PM volumes. Each region must await its turn for publication or re-publication in the series, therefore it is inevitable that years pass by before a particular necropolis can possibly become the primary focus of the PM team. Volumes III-V, for example, record Old Kingdom data from Memphite and provincial cemeteries, yet 33 years have slipped by since the publication of Volume III , and 70 years have passed since the publication of Volume V. These time-spans explain why the preparation of a bibliographical database was an attractive project for the Oxford Expedition - as long as the parameters of the project could be limited conveniently and the data could be gathered, researched, processed, and input in the relatively short time-span between 2003 and 2006. Although PM is the 'parent' reference for the OEE Database, the organization of data in PM is very different, particularly in terms of regional scope and primary focus. The OEE Database covers all of the known Old Kingdom cemeteries simultaneously, and its narrower primary focus is the occurrence of scene types and their relevant scene details in tombs (scene details being mentioned only incidentally in PM). 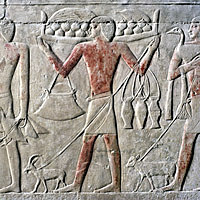 In reality the OEE Database has the potential to develop far beyond its 3-year limit, for, in addition to scene types and scene details, there are numerous other reliefs and paintings not included in the current database: processions of bearers carrying offerings; lines of estate personifications with gifts from productive lands; individual priests and scribes performing their duties; representations of the tomb owner and family members; figures of officials, servants and household pets; species of animals, amphibians, birds, fish, and plants; hundreds of man-made and natural objects, and hieroglyphic inscriptions too numerous to be counted. Scene types and their scene details were selected as the primary subject matter of Phase One of the OEE Database because they are easily identified, and they constitute the most varied source of information for academic and non-academic research. Furthermore, the scene types, their scene details, and even the details within their scene details, transfer perfectly to a sequential database - similar to a 'family tree' branching from a grandparent, to a parent, then to children and grand-children. Since this is the core structure of our ever-developing database, it is explained in greater detail in the section entitled 'Overview: The Database'.